Sweetest Day is celebrated on the third Saturday of each October and originated in Ohio. The point of Sweetest Day is to give gifts such as greeting cards and candy to loved ones. The Midwest celebrates the Sweetest Day more than the South, West, and East coasts. This Sweetest Day skip the candy and instead make a homemade treat with our high quality Our Family brand products and recipes from Family Fresh Market. If you prefer to make the recipe as written with rich, indulgent ingredients, that's okay! Sweets can be part of a balanced diet when consumed only on special occasions, such as Sweetest Day, and in moderation, meaning a small portion. To celebrate Sweetest Day, we wanted to share with you simple ingredient swaps that will allow you to make delicious, yet nutritious sweet treats! Another tip is to increase the vanilla extract and/or cinnamon in a recipe. These both give off a sweet-like flavor that can help make a treat seem sweeter without added sugar. At most, double the amount of these ingredients. Remember, baking is a science and each ingredient plays an important role in the finished product. If amounts and ingredients are changed too much, a recipe will not work. When substituting ingredients to make a healthier treat, always substitute one ingredient per batch until you know what works, and what doesn't. 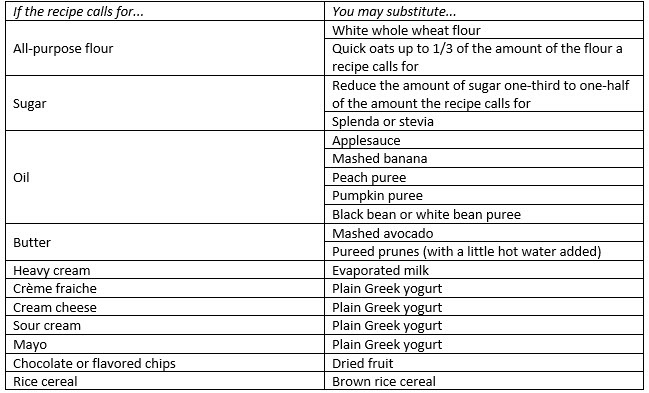 From there you can combine substitutions to meet your nutrition goals. To get started, Dannon Greek Yogurt is on sale this week at 10 for $10! As mentioned above, plain Greek yogurt can be substituted in place of a few ingredients and boosts the protein while reducing overall fat. If you have a recipe, cooking, or baking question, email LivingWell@spartannash.com for helpful solutions! Here is my recipe for my favorite treat: Chocolate Chip Cookies! These cookies are made with whole grain flour and less sugar compared to regular chocolate chip cookies! Enjoy and Happy Sweetest Day from the Living Well Team! Cream together the butter, white sugar, and brown sugar until smooth. Beat in the eggs one at a time, then stir in the vanilla. Add to batter along with baking soda and salt. Stir in flour and chocolate chips. Drop by large spoonfuls onto ungreased pans.